TO THOSE WHO WATCH her co-host “Good Morning America” on ABC, Robin Roberts is practically a member of the family. To people affected by cancer, she’s a peer who understands the journey. And to oncology nurses, she’s more than a former patient: On May 17, Roberts served as keynote speaker for CURE®’s 12th annual Extraordinary Healer® event, which honors oncology nurses who go above and beyond the call of duty to help patients and peers. Roberts has reported news around the globe and received honors including the Walter Cronkite Award for Excellence in Journalism, as well as the title of Most Trusted Woman on Television, based on the results of a Readers’ Digest poll. She has also affected the national conversation by publicly discussing her experiences with cancer. Roberts received a breast cancer diagnosis in 2007 and then, five years later, learned she had the rare blood disorder myelodysplastic syndrome (MDS). By sharing her journey, Roberts inspired more people to undergo breast cancer screening and donate bone marrow for transplant. Roberts spoke with CURE® about her participation in the Extraordinary Healer® event and her journeys with cancer. CURE®: You gave the keynote address at CURE®’s Extraordinary Healer® event May 17. Why did you want to speak to oncology nurses? 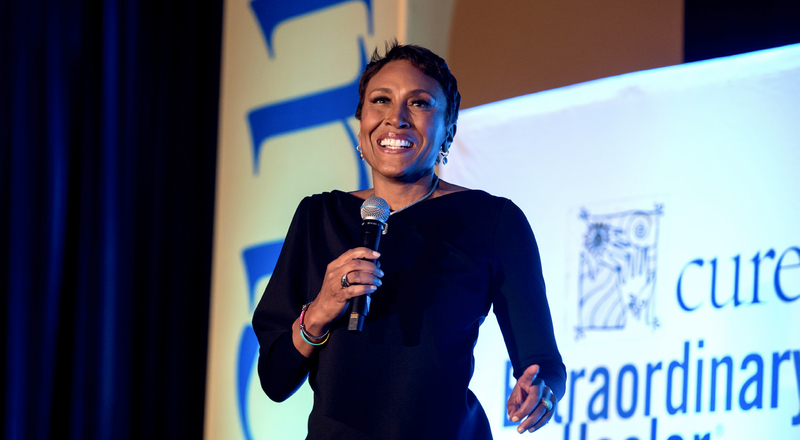 Robin Roberts: I wanted to say thank you. Nurses in general and oncology nurses in particular are unsung heroes. They are on the front lines. They know what is working with the patient, sometimes faster than the doctor. They can see not only our reactions to the treatment but (also) our emotions. Recently, one of my nieces graduated from nursing school. I went back to Mississippi to speak at her graduation and to hug her when she walked across that stage, because I know that nurses are special souls, and I’m really grateful for those I’ve had in my life. Were there any specific oncology nurses who helped you? There was one nurse in particular, Jenny Tran (B.S.N., RN, of Memorial Sloan Kettering Cancer Center in New York City). After my bone marrow transplant for MDS, my blood counts went down very low. One evening, I ushered everybody out of my room. After they left, I felt myself slipping away. I get emotional just thinking about it: I was in so much pain, and my mother had passed away less than a week before my transplant, and, you know, you stub your toe and you want your mom, so going through something like this, I definitely wanted her. I felt myself just giving up, and I kept hearing somebody calling my name. I opened my eyes and it was Jen. To this day, I know it was my mother’s voice, but it was Jen. I don’t think this was on her rounds; I think she had that connection with me, as she has with a lot of her patients, and I’m so grateful that she was there to bring me back. It helped me through a very difficult time. What’s your health status these days? Strong like bull! I’m not one of those people who use the word “remission,” but I’m grateful that at this point there is nothing detectable. I get my regular checkups, and I just love that I feel like myself again. It took quite a few years. I’m back doing Pilates and cycling, but just more than that, I’m clearheaded. Chemo brain is not a myth, it’s a reality. It takes time for these lifesaving chemicals and treatments to go through our bodies. Though I still use chemo brain as an excuse when I want to get out of something! What details about your breast cancer experience are you comfortable sharing? I was living happily ever after, with no family history of cancer, and found a lump in my right breast. Thankfully, I had done self-exams, and so I realized that this lump was different and I needed to have it examined. The mammogram came back perfect, but my doctor had also put in a prescription for a follow-up ultrasound, and that’s how the tumor was detected. Then I had a needle biopsy, which determined that it was cancerous. With more testing, it was determined to be triple-negative breast cancer. I had never heard that term, and I was bewildered. Plus, I was told that, as an African-American woman, I was less likely to be diagnosed with cancer, but now that I was, I was more likely to die from it. What in heck do you do with that stat? That’s why I’m so grateful that my mom encouraged me to make my mess my message. I’m a fairly educated person, and I didn’t know a lot until I was diagnosed. I wanted other people to know that, yes, mammogram is still considered the gold standard, but if you have dense breast tissue, to ask for secondary screening. And I was very touched by hearing that so many people immediately went out and got screened. One bunch of girlfriends said they got a limo and made a date of getting their mammograms and then went to a party, and that they were going to do it annually so they could keep an eye on each other. A chemotherapy you took for your breast cancer caused you to develop MDS. Did that make you second-guess your treatment decisions? Because I was triple-negative and young, my chemotherapy and radiation had to be aggressive. I have no regrets whatsoever that I received the treatment that I did, because it saved my life. It is unfortunate that I had the really, really rare experience of finding that the treatment that saved my life had later put it in peril. I’m cautious about discussing that, because I’d never want anybody to avoid treatment for fear it could lead to something else. You have to fight the battle that’s in front of you. How did you learn that you had MDS? It came out of the blue. I was doing well, getting my checkups, and then I started feeling a bone-weary kind of fatigue. My blood counts were down, and (my care team) thought it was an infection from traveling. I had the bone marrow test and was as shocked as everybody else. But, again, I made my mess my message by getting the word out about joining the registry to donate marrow for transplants. I had thought it would be automatic that one of my three siblings would be a match for me, but I learned that only happens 30 percent of the time; 70 percent need somebody off the registry. Of my siblings, only one was a match. My other two were not even close. How did you decide to discuss your cancer journeys on the air, and how do you feel about those decisions in retrospect? It was difficult for me being in the public eye, knowing I was going to lose my hair, knowing I was going to be missing work, and I wanted to control the story. I didn’t want others telling it and making it far worse than what it was. It was not an easy decision, but it’s one I don’t regret. I remember the first moment I went on national television and said, “I have breast cancer.” That night, I slept the best I had since my diagnosis. I felt the prayers; I felt the well wishes. I felt I wasn’t hiding anything anymore, and it was a relief. My mom was the one who encouraged me, because she and my father were always about being of service to others, and I really felt it was a teachable moment. We only shared that which we thought would be helpful to the public. There’s not a day that goes by when somebody doesn’t mention how my story helped them. For some, it’s just the fact that I talked about MDS, because not many people do. An honor I’ve received that means a lot is the Peabody Award, one of the most prestigious in our industry. They gave it for my journey, saying that, as a network and as a program, we used that opportunity to be of service. That was a real validation to us, but an even bigger one was the public responding and saying how many people had been tested and how many were uplifted and how it helped them through whatever it was that they were facing. What are your thoughts on working during treatment? There’s a difference between wanting to work and needing to work. I wanted to work. So much is taken away from you that you crave normalcy, and for me, that’s getting up, coming in and saying “Good morning, America!” But there’s no rulebook, and you have to figure out what’s best for you. I would hope that it falls on the patient to decide what it is they want to do. I’m so grateful to the Walt Disney Company for standing by me and never making me feel like my job was in jeopardy. I cannot imagine what it’s like to go through something like I went through and have to worry about your livelihood. Everybody should have the opportunity, if they have to stay at home, to still get paid. It shouldn’t be a luxury. What did you do to ease the stress, worry and side effects that come with cancer and its treatments? With MDS, I lost quite a bit of weight — I was barely over 100 pounds — and my doctors would say, “You’ve got to eat.” Everything made me nauseated, so I would watch food channels so I could see food without smelling it, and something would spark my appetite. Then I would say, “Oh, I think I want this,” and my partner or whoever was with me would run out immediately and get it. Quiet time or meditation is also important, because it’s as much mental as physical when you’re going through this. I liked watching comedies and just trying to keep a lightness. What really helped was maintaining my optimism. Optimism is a muscle that gets stronger with use. You’ve got to get in the habit. It takes courage to believe the best is yet to come. It was a mindset. Part of it is remembering to focus on the fight, not so much the fright. I also surrounded myself with positivity and positive people. I didn’t want to say, “Woe is me,” I didn’t want anybody tilting their head. I now realize that my friends and family who were caring for me would break down outside my presence. It helped that they stayed strong in front of me. One of my dear friends, may he rest in peace, (sports journalist) John Saunders, showed up one day at “Good Morning America” with some lemon drops for me. He just stopped by my dressing room, handed them to me, hugged me and walked out. People often ask somebody who’s going through it, “What do you need? What can we do?” We don’t know! Just do something, be there. It’ll be fine; we’ll be appreciative. What else do you want people to know about the cancer experience? That we all have an inner strength that we don’t realize. If somebody had said to me years ago, “You’re going to have cancer, you’re going to go through it twice, and you’re going to be told you have a year or two to live,” I wouldn’t have expected to have the strength to deal with that. It’s funny how a lot of people say to someone going through this, “You’re so brave,” because the last thing you feel is brave. But then you realize that — you know what? — we all are just a little bit stronger than we think we are. I say this all the time: When fear knocks, let faith answer the door. Have faith that if you’re diagnosed with cancer or if someone you love is diagnosed, there are oncology nurses, doctors, clergy and a battalion of other people who will be there and want to help you get through it.